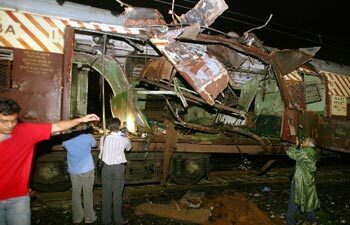 Technologically, the rail network is centuries behind its western counterparts, and it will fail every safety test that they will contrive. But the fact remains that it is the only thing that is capable enough to carry crowds of the magnitude that is common to Mumbai. I mean can the London Metro (Underground as they call it), so proud of its efficiency carry crowdsfive times its mandated capacity? 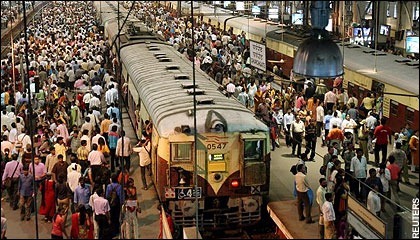 To put things in perspective, the number of people traverssing through Dadar ,a very important junction on the Mumbai rail network, at 7.00 pm everyday, exceeds the entire population of Belgium. The very fact that the local trains ferry an entire European country everyday/night, and yet runs on time, I ask you to pinpoint any other suburban rail network which match the Mumbai Locals. Today, Mumbai is a land of great disparity and differences. However such differences hold no water when it comes to a local train. Be it a Hindu or a Muslim, a North Indian or a South Indian, a Millionaire or a Slum Dweller, all are reduced to the same group of scrambling individuals, trying to find a toe-hold in the cramped environs of a local. Adjustment is an understatement as 5000 people cram into a train meant for 900. And inhuman is an euphemism, if someone has to describe the conditions that the commuters have to endure. A Mumbai local train makes hell seem like a suite of a five star hotel. From the morning fisherman,to the afternoon dabbawala and even the occasional dead body, the local trains serve every aspect of the society prevalent today. And it is in these ghetto like atmosphere of a rail compartment, that u find the real human spirit coming to the fore. Amidst the tremendous hardships and infernal conditions, it takes more than a human being to even think of helping others. And a Mumbaikar towers upon his compatriots from the other parts of de world. No matter how crowded a train is, no matter the numbers in a train exceed that of France and are nearing Germany, a Mumbaikar will always make space to accommodate one more of his kind,that too with a big smile. His understanding of others difficulties is unparalleled, coz if he sees someone running after a moving train and is in danger of missing it, a mysterious hands will pop out and pull him aboard. It will also hold on to him/her until the poor fellow manges to get a toehold.That hand will not bother bout the caste, religion,sect or the social status of the person concerned. Its only concern is that the poor fellow should not miss his/her train. The hand understands the ramifications of a missed local on a commuter. And it is this generous and the caring spirit that Mumbai has, ensures that the city runs at its peak at all times. Floods and messers terrorists, go to hell. 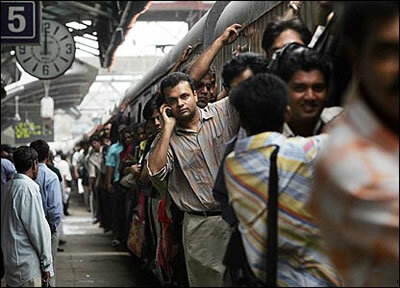 This entry was posted in Anything under the sun and tagged Compassion, Crowd, Humanity, Local Train, Mumbai, Understanding. Bookmark the permalink. 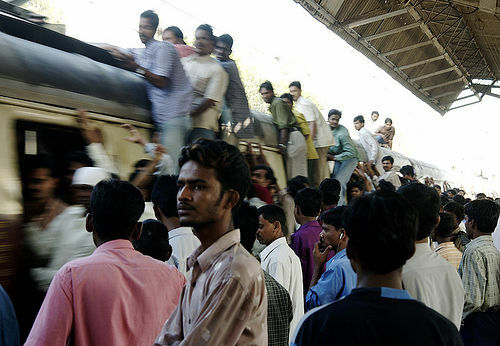 Living in Mumbai myself, I am always surprised by the human connection that all the passengers in a local train share.. But what about the 1% in Mumbai, who control maybe more than half of its wealth.. 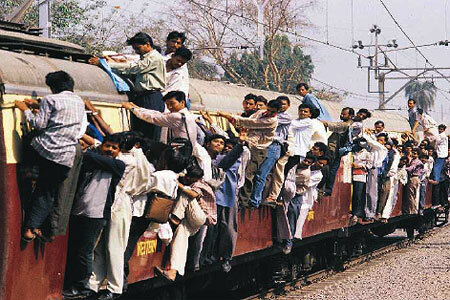 The rail network is indeed a teeming sea of humanity..
Good one. Indeed the locals are our lifeline. You should travel in a Lady’s Special…. its a different experience alltogether… birthdays, anniversaries all celebrated with so much joy and fun. I agree its life line , its taking in more passengers than any train of similar capacity can. fascinating how you please find pride in this most horrible & discomforting state of travelling. “Mumbaikar will always make space to accommodate one more of his kind,that too with a big smile” – you must be high to make a statement like that. Amazing perspective and 1200% true! yet you hide behind that ‘kaipullai’s vetti thoughts” mask.